Blog Artificial Intelligence Are Chatbots the Next Project Managers? Are Chatbots the Next Project Managers? As artificial intelligence software (AI) products continue to expand their scope of capabilities, people keep asking, “What about the humans?” Some of the people pondering their robotic replacement should be project managers. Chatbots, with their ever-evolving capabilities, have come a long way since AOL Instant Messenger’s SmarterChild. Since 2000, millions of people talked to this little chatterbot. But early chatbots like this were about as helpful as a salesperson on your development team. Early bots provided some entertaining goofiness while laying the foundation for today’s near-human intelligent messaging programs. New bots pop up every day. Some can barely hold a conversation, but others can gather vast sums of data, automate sales processes, schedule appointments and recruit new employees. Big data software software is already benefitting project managers across the world. The tools help organize cross-functional teams, optimize resources and improve security. Imagine these tools powering a communicative bot. They would have the ability to send reminders, alert users of updates, and increase ROI by eliminating wasteful spending and tasks. Today’s project manager is a jack of all trades. They need to be confident leaders, keen to detail and good at planning. While they are a key factor in just about every industry, they are still bound to human limitations. 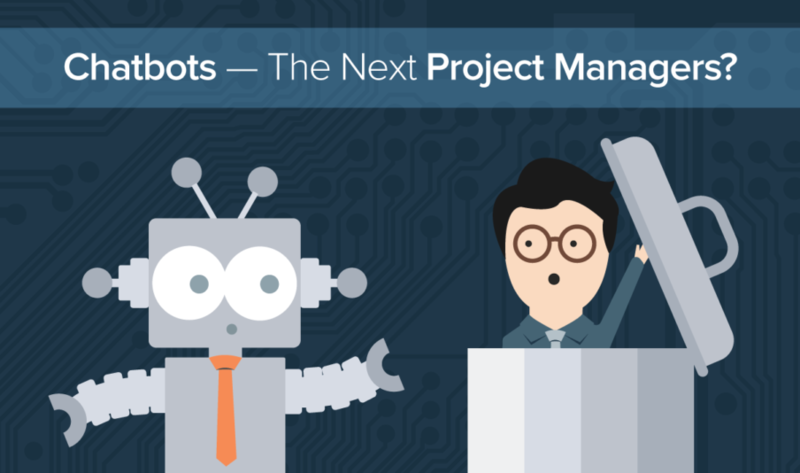 Tomorrow’s project manager, the chatbot, can better identify process issues, predict results, optimize schedules and diagnose technical issues. And tomorrow is just beyond the horizon as companies leading the AI evolution are already snatching up startups and improving chatbot capabilities. Microsoft Project Online already has a set of APIs for integrating project data and external information into a natural language software interface. Cisco united Cisco Spark, a cloud-based messaging platform, with Redbooth, a project management software platform. The product integration allows Redbooth to become an all-knowing entity within your project. It can instantly answer your questions, alert you of remaining tasks and monitor your performance. In March, Google announced a new tool for G Suite called @meet. It uses natural language processing and AI to automate scheduling tasks within Google Hangouts and Calendar. How Google is integrating chatbots into everyday life. Startups in the field are emerging as well. A prime example is Tara, an exciting new tool that builds bots, finds freelancers, and manages projects for them. It’s hard to see how deeply chatbots will embed themselves into everyday applications and business processes; I mean, I still never ask Siri questions unless my hands are full. Still, enormous companies are betting on the future through the chatbot evolution, and it will be hard to abandon the concept. For now, project managers can remain calm as their roles are safe, but they should be weary of chatbots slowly stealing their jobs from right under their nose.